In the 49th issue of the Bed and Breakfast Traveller, we take you to the beautiful Bay of Chaleur, located in the Acadie-Bathurst Region of New Brunswick. The Bay of Chaleur, officially declared one of the most beautiful bays of the world, is hugged on the north by the Gaspé and on the south by the rollicking Acadian Coast of New Brunswick. Fed by the mighty Restigouche River and the mysterious Nepisiguit River, as well as many smaller rivers, the bay offers the best in seafood and scenery and warm hospitality. The best of the bay -- lobster, scallops, oysters, clams, shrimp, cod, mackerel and more -- can be enjoyed throughout the Acadie-Bathurst Region. Lobster season starts May 1; visitors can stop at the many local wharves and photograph the day's catch. Boat excursions and even fishing experiences are available. 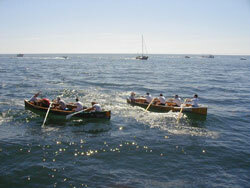 The scallop draggers start July 1. This summer the restaurants in Acadie-Bathurst Region of northern New Brunswick are offering a Seafood Odyssey. 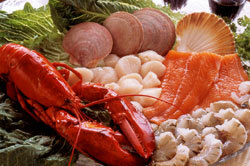 Simply follow the Acadian Route to delicious travels. The views are exhilarating! From the old folded mountains gazed from Jacquet River to the sunrises lighting up the Bay, every turn brings another chance to click an even better image. The #134 highway curves along the shore with easy access to seaside spots. Public beaches welcome visitors to enjoy the Bay of Chaleur. The tower at the Mining Centre, an interactive museum experience, provides wide vistas of the Bay. The Beresford Marsh is one of very few places in the world to find the Maritime Ringlet butterfly. The walking trails at Daly Point Reserve take you along tidal flats and fields of sea lavender. 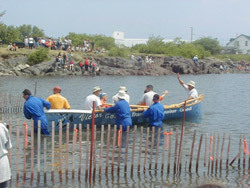 Villages and towns celebrate the Bay of Chaleur with festivals and feasts and warm hospitality. Festival des Rameurs will be June 29 - July 3, 2005. Rowers will race from Petit-Rocher along the coast to Bathurst and back. The evening parade starts at 7 pm followed by music and dancing. Early July the entire Acadie-Bathurst Region gathers in the City of Bathurst to celebrate Hospitality Days with lots of music and good food. The last week of July is Belledune Homecoming Week. The Scallop Festival runs on July 29, 30 & 31, 2005. How many different scallop recipes have you tested? Can you tell the age of a scallop shell? Accommodations range from country inns and B&Bs, village heritage homes, to a secluded seaside getaway with private balconies overlooking the Bay of Chaleur. Once you have tasted and exhilarated in the gifts of the beautiful Bay of Chaleur in the Acadie-Bathurst Region you will want to return. For more information, simply visit www.acadie-bathurst.com.